This morning was beautiful in Massachusetts. I rolled out of bed, put on my pants, an old sweater and slipped on my fuzzy slippers. Outside the sun glistened upon a trace of snow. I opened the door to retrieve my daily Boston Globe. One step was all it took…. Ever notice how an accident is never graceful? With one step off the porch my foot hit a film of black ice. In a moment I was on my back, lying on the sidewalk. It’s impressive how quickly you can go down four steps and land on concrete. Gradually, we (Coco, Mike and I) decided that I was ok. Everything worked. I took a few ibuprofen and got on with my day. My accident reminds me of how lucky I was not to break something and how the rest of my day could have proceeded very differently. A reminder of how unpredictable life is. We roll out of bed and think we know what is going to happen….and, ‘BAM’, we find ourselves flat on our back. Accidents by definition are never graceful. 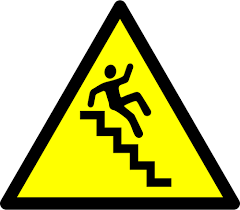 No one falls down the stairs or off a ladder ‘gracefully’. But such moments can be ‘full of grace’. By grace I speak of an awareness that we’re not alone. Whether we are on top of the world or flat on our back, that mystery we call God/Spirit is with us, especially when we are most vulnerable. Like it or not, stumbles are part of the rhythm of every life. No one avoids falling down the stairs. Ruminating on this…and feeling a little bruised, I happened upon a poem by the Australian poet, Joel McKerrow. Here’s a portion of that poem entitled ‘We Dance Wild’. This poem speaks to me and perhaps will speak to you too. Not a two-step, structured repetition. We dance large. Coco the Labrador who rescued me, didn’t have an IPhone. Great poem! Having had the experience, I can affirm it. Jeanne, so true. Eventually we all fall and are lifted up. This is another exquisite reflection, Kent, which I will share with my father in the hospital. He fell on black ice today and broke his leg. This is where we both meet God. Karen, so sorry about your Dad. Glad he is close by for you to check in on him. Tell him I’m sorry! I came very close to having the same outcome. And, where you and your Dad are both met by God. Glad your body didn’t break and thanks for the poem! Marge, I as really fortunate.